It is November 14th, 2009 at 8:45 pm in Las Vegas, Nevada. It is minutes before a WBO welterweight championship fight. It is 11:45 am in General Santos City, Philippines. It looks like a ghost town there. The streets of General Santos City are completely empty. Everyone is glued to a television anticipating Manny Pacquiao's fight against Miguel Cotto. Manny Pacquiao dealt with extreme poverty in his childhood. He often slept in a cardboard box. He had to drop out of school after the third grade to help support his family. Manny Pacquiao sold donuts on the street to make money. He promised his family that he would get them out of poverty. His uncle introduced him to boxing at sixteen years old. Manny Pacquiao weighed only 98 pounds. He was under the weight minimum. But, he put steel in his pockets to reach the official weight of 106 pounds. Manny Pacquiao's hometown is General Santos City in the Philippines. General Santos City has a growing population. Additionally, Philippines is a third world country. There is a third of the pollution living in poverty. Many people there live on less than $1 a day. 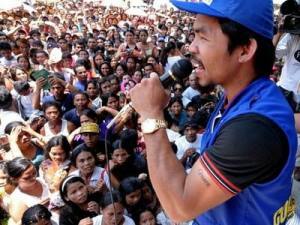 Manny Pacquiao lives in General Santos City even though he could live anywhere in the world. He is the sixth highest paid athlete in the world with a total of 40 million dollars. (newsinfo.inquirer.net/inquirerheadlines). He has to deal with threats of kidnapping and terrorist activity. He has employed thirty bodyguards to protect himself and his family. He travels in the Philippines in a bulletproof van. Manny Pacquiao wants to help solve the many problems that plague the Philippines. "I wanted to become a congressman because in my heart. I really want to help them" (www.victoriaadvocate.com). He has been elected a member of the house of representatives in the 15th congress of the Philippines representing the province of Sarangani. He will be sworn into office in late June and he can fulfill his congressional duties in July. He defeated heavily favored candidate Roy Chiongbian. Roy Chiongbian is from a billionaire family. Manny Pacquiao is the first professional boxer to hold national public office while still active in the ring. Manny Pacquiao was an underdog in the election. People thought he was going to lose because of the corruption that exists in Philippines politics. However, he has a true connection with the people of the Philippines. They believe he will make a difference. "There is a feeling that Pacquiao is one of us, one of the people, so we want to choose the right candidate to help us and that's Manny" said Cynthia Leandres a health care worker (boxing.fanhouse.com/2010/05/10). It is 12:33 AM in Las Vegas on November 14th, 2009. Manny Pacquiao versus Miguel Cotto fight is stopped at 55 seconds of the 12th round. Manny Pacquiao defeats Miguel Cotto by technical knockout. Miguel Cotto could no longer take Manny Pacquiao's three punch combinations. He was being hit by Manny Pacquiao's lightning fast punches throughout the boxing match. The crowd was chanting "We want Floyd" near the end of fight. Across the world in General Santos City, Philippines at 12:33 PM people were cheering about Manny Pacquiao's impressive victory. He has once again proved that he is the best boxer in the world. Manny Pacquiao is a man of the people. PhilBoxing would like to welcome Loren Robinson to the Philboxing family of writers and contributors. Click here to view a list of other articles written by Loren Robinson.